I was still up at almost 4am and found myself frustrated about something. After much deliberation I turned to food for comfort like I have many, many, many times before. At least this time, because I still had my goal in mind, I chose somewhat healthier foods (as opposed to ice cream, candy and chips) and stopped myself before I had completely undone all the progress I’ve made. Also interesting to note is that this was the first day I hadn’t really worked out since starting this challenge. Sure I had walked for about 40 minutes, but that’s way different from doing ChaLEAN Extreme or TurboFire. Way different. 6:20pm WORKOUT #1!! ChaLEAN Extreme Burn It Off and TurboFire FIRE55EZ then a short walk around the park while the boys kicked a soccer ball around. Why did I split up my workout? Because my family needed food so I threw together some dinner and baked it while we went outside. 36oz water. 8:30pm Lunch (aka Dinner for the rest of the family) – 12oz. 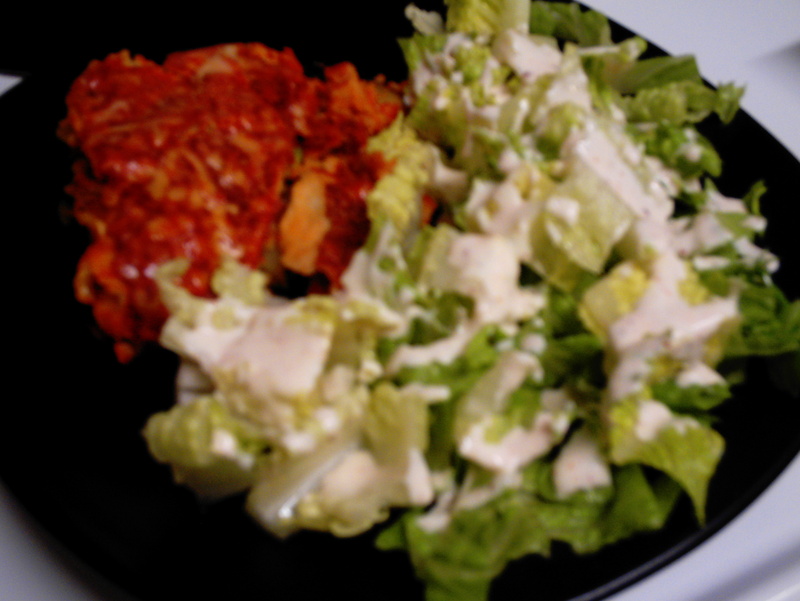 water and 2 Slimming Formula tablets, 4 c. shredded romaine lettuce with dressing made from 1 Tbs. Hidden Valley Ranch dressing, 1 Tbs. 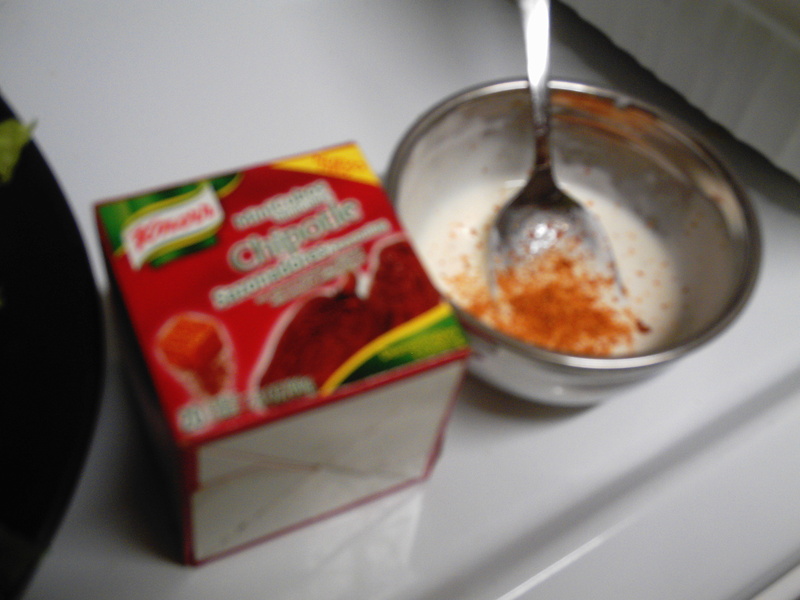 light sour cream, 2 tsp skim milk and a pinch of chipotle seasoning. It’s from Knorr and comes in little cubes. 1/8 of the Veggie and Cheese enchilada casserole thing I made from scratch. 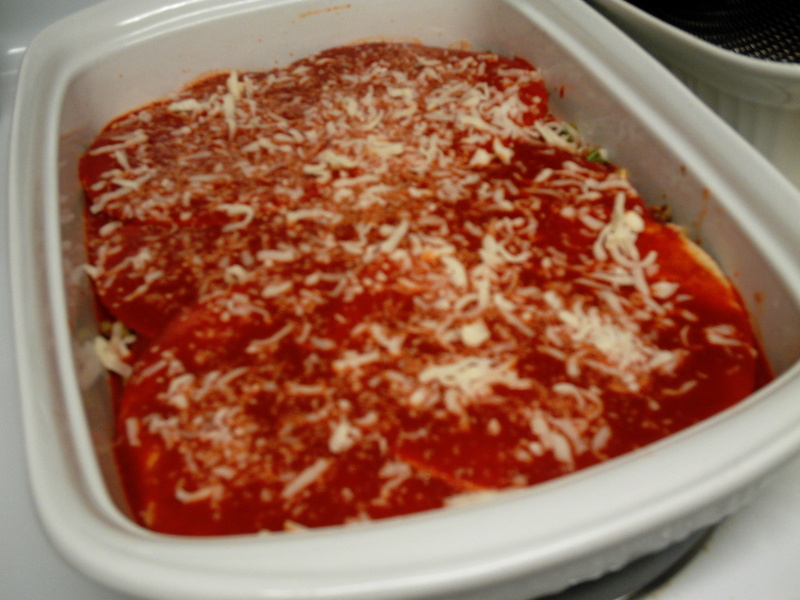 The plan was to make actual enchiladas, but this was much easier and faster. Here’s the recipe. The veggies I used were just what I had in the fridge. I think this would be very forgiving and you could use lots of different combos. It could also be great with green sauce. Pre-heat oven to 350. Spray 9×13 pan with Pam. 1. Heat large skillet to medium-high and add olive oil. 2. Add veggies, salt, chili powder and garlic powder (or fresh if you’re not lazy or in a big hurry like I was). 3. 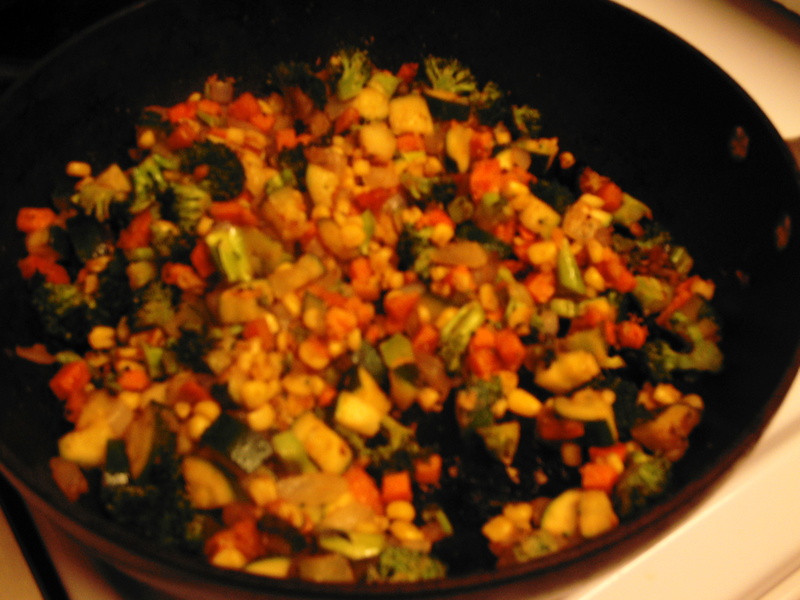 Cook veggie mixture until crisp-tender and a little browned. 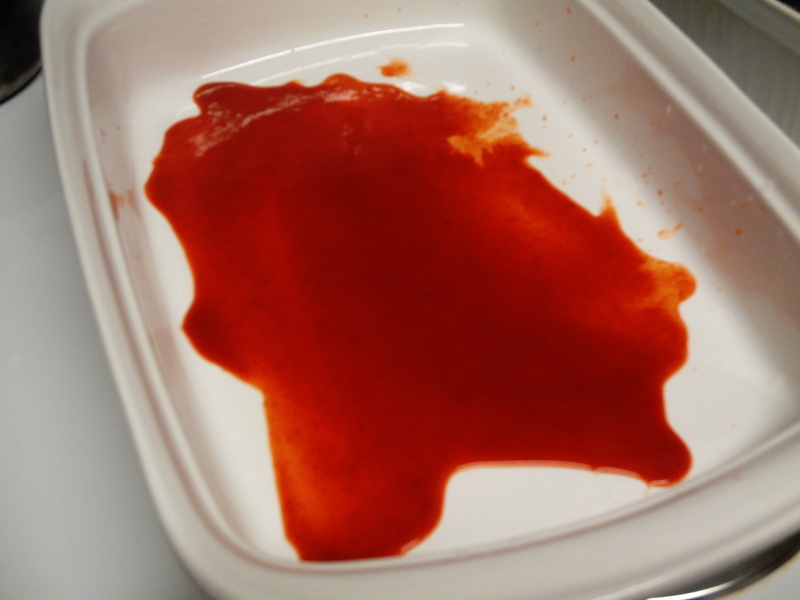 Meanwhile, start prepping the pan with enchilada sauce and half the tortillas by spreading 1/3 c. sauce in the bottom and covering with tortillas then another 1/3 c. sauce. Nope, I didn’t heat the tortillas or coat them in sauce. Just put them in straight from the fridge. Easy. 4. 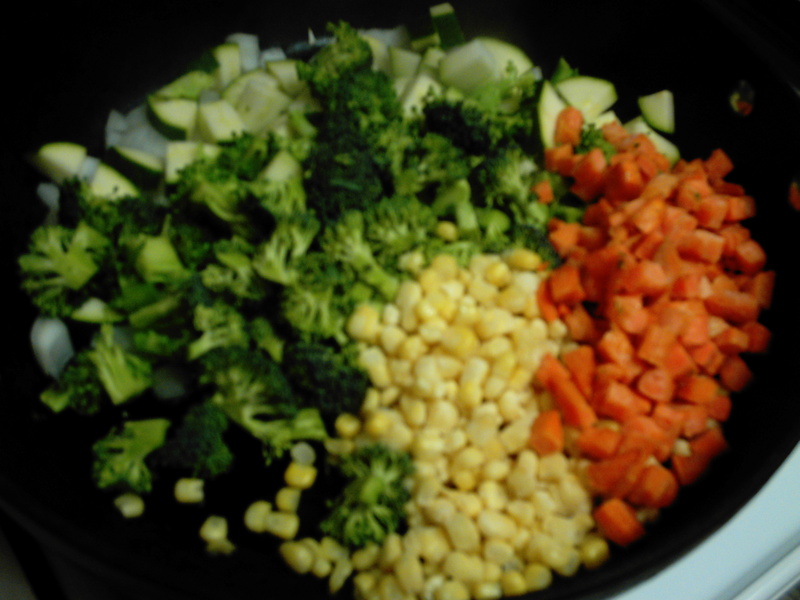 Spread the veggie mixture evenly over the bottom layer of tortillas. I was trying to keep the calories low and didn’t want a bunch of tortillas so I just did one layer. 5. 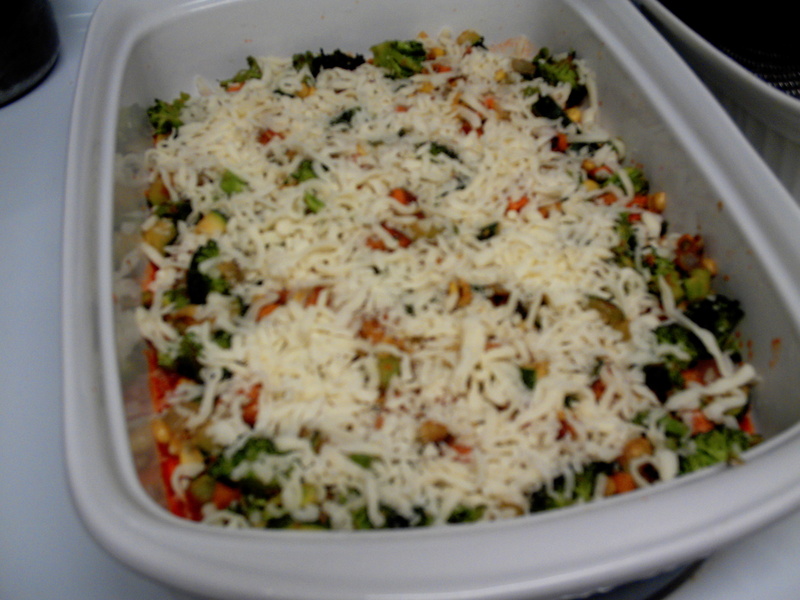 Cover the veggies with about 6oz of the shredded cheese. Save the rest for the top. 6. 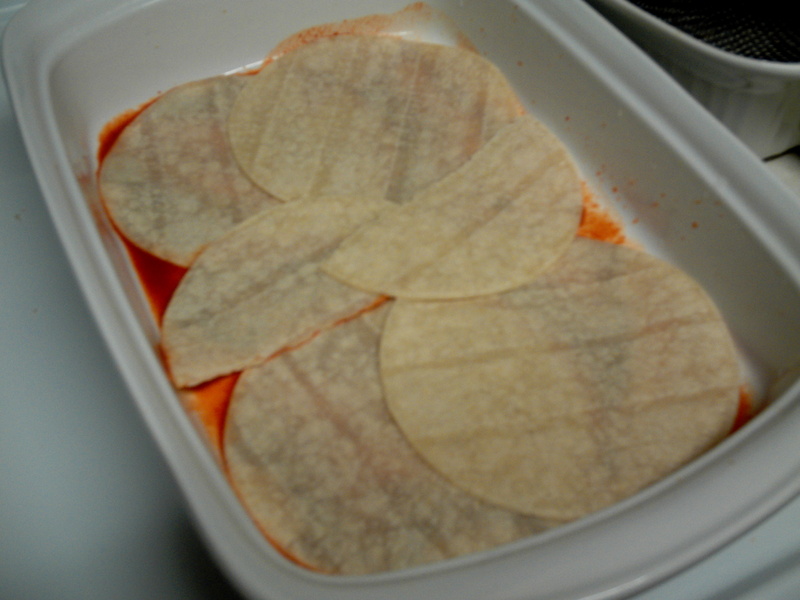 Cover with remaining 5 tortillas, the rest of the sauce and sprinkle with cheese. 7. Bake uncovered at 350 for about 30 minutes or until heated through. Mine stayed in the oven about 40 minutes because we were outside and the veggies ended up a little softer than I would’ve liked, but it was still good. If I had green onions and/or cilantro I would’ve sprinkled them over the top before serving for sure. Each serving (1/8 of pan) had 11g protein, 29g carbs, 7g fat, 4g fiber and 215 calories. Today could have been a total disaster or at least a wash with the extra calories from my early morning mishap, but by incorporating lots of veggies into the rest of the day I stayed full and kept the calories right where I wanted them. Yay veggies! !